If you need to drive the roller along the road for any distance, the operator should flip up the scraper bar to prevent wear or to prevent the potential for it to be sucked into the drum. Both photos courtesy BOMAG Americas. Every piece of equipment in the paving train—the truck delivering the asphalt, the paver laying it and the rollers compacting the mat—must work at optimum efficiency to keep the train rolling, achieve spec densities, and finish the job on time and within budget. If just one machine in that train isn’t working properly, it can cause downtime or delays that potentially cost the contractor thousands of dollars a minute. Today’s asphalt rollers are some of the most advanced and reliable ever built. Technology can map a jobsite, tell the operator if “soft spots” exist in the mat and alert key service personnel of upcoming maintenance requirements before they are due. Even with all this technology built into a roller, there still is potential for things to go wrong in the field. Bert Erdmann, product manager—heavy compaction for BOMAG Americas Inc., talks about the importance of having back-up plans and redundant components on rollers, so a problem in the field doesn’t affect compaction results. He mentioned working in an area where GPS-based systems don’t work, specifically. Having a back-up compaction measurement system in place can help determine progress, he explained. When buying a roller, he recommends looking for redundancies of critical system components to reduce the chance of a downtime occurrence. “Some mainline rollers are built with a back-up water pump for the spray system, since water is critical in preventing asphalt material pick-up on drums or tires,” Erdmann said. Thinking beyond designed machine redundancies, there are several practices the roller operator can implement into his or her daily routine to prevent or reduce downtime at the jobsite. One key practice begins before the roller even makes it to the jobsite. It cannot be stressed enough that establishing and conducting daily routine maintenance checks at the start of the shift will go a long way in preventing roller downtime. 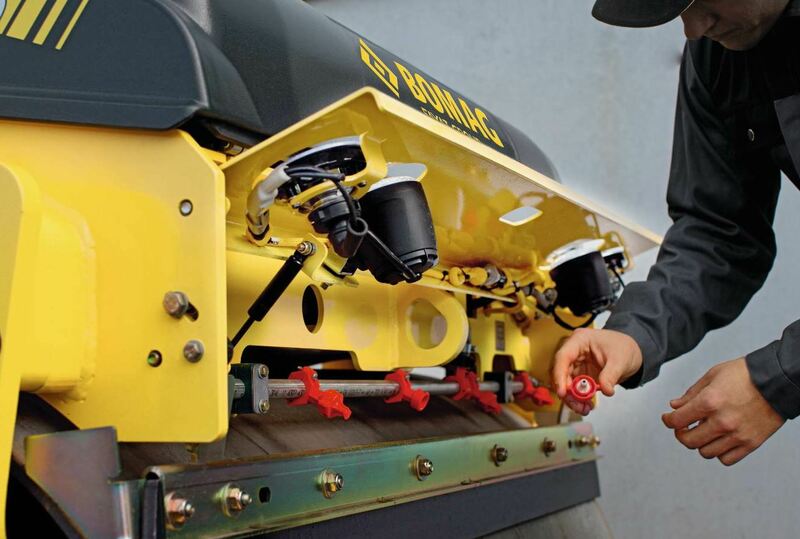 From the engine oil to the water tanks, operators should ensure all the fluids are topped off. Operators of pneumatic tire rollers should check the release agent tank level and make sure the water spray system is operating correctly, as these systems prevent material pick-up before the tires heat up. The ballast compartments should be inspected and filled with the correct type and amount of ballast material to meet specified tire pressure loading. Also, if equipped, the roller’s tire inflation system compressor should be checked for proper operation. The articulation joint and pivot points on many older rollers will require daily greasing. Operators should ensure that the proper amount of grease is applied, so material build-up doesn’t occur at the joint, which can lead to excess wear and premature failure. “Alternatively, companies can purchase rollers that have no “grease daily” fittings like BOMAG tandem rollers, allowing crew members to reduce daily maintenance requirements and get to work faster,” Erdmann said. The roller operator should have on hand spare small parts such as spray nozzles and fuses. One common item to slip the operator’s mind when roading a roller, according to Erdmann, is leaving the scraper bars against the drum. This bar is an integral part of the spray system, evenly spreading water on the drum to prevent material pick-up. Not pivoting the bar away from the drum when roading longer distances can lead to premature wear, uneven water distribution, or, in the extreme, “the bar could be sucked back into the drum, which will require the scraper bar to be replaced,” he said. Spray bar and nozzle clogging can occur during operation. This will lead to uneven water distribution across the drum and asphalt material pick-up. If the operator notices a clog in the water system, most of today’s bar designs include a quick-disconnect nozzle that can be removed and reconnected at the jobsite. End caps on the spray bar can be removed by the operator to flush larger pieces of debris that get stuck in the bar. To reduce system obstructions, a best practice is to fill the tank with clean water. Be sure to regularly inspect the water tank and remove any debris. Also, make sure the screen at the fill cap is in place and in good condition to strain out any particles transferred by the water truck. Today’s engines operate at much higher pressures and temperatures to meet environmental regulations. As part of roller design, manufacturers have worked with engine suppliers to ensure there is enough cooling capacity for reliable operation, even during extreme summer heat while compacting mats in excess of 250 degrees Fahrenheit. Checking the air filter’s condition at the start of the day will go a long way to keeping the engine running within the designed temperature operating range. Also, if the operator notices the temperature gauge rising while compacting the mat, the radiator should be checked for debris to prevent overheating. Rolling in the elements. Advancing machine age. Higher levels of technology. More electronic components. Today’s roller relies and puts more pressure on the electrical system more than at any time in the past. While roller manufactures like BOMAG design the system for years of dependable operation, machine age and harsh operating conditions can take their toll. This is why Erdmann recommends keeping spare fuses within the operator’s reach. “Having a few spare fuses on the roller can allow the operator to perform a quick-fix versus waiting for a service truck to make it to the jobsite,” he said. This simple practice could save thousands in lost-time productivity. The operator spends the most time on a roller and probably knows it best. Therefore, he or she will know when the machine is working properly and when something isn’t quite right. As soon as the operator notices something not working right, he or she should notify the service department, so it can be addressed during off hours or before a small repair turns into a major downtime issue. This practice is especially critical if the roller isn’t equipped with a telematics system that offers early detection of operating issues. To aid the operator’s eye of the machine’s condition, roller manufacturers equip the dashboards with multiple gauges for critical components. These gauges provide a quick-glance of critical operating parameters such as engine temperature, oil pressure and charge control. Fluid level indicators and gauges inform the operator when items like the fuel, water or DEF tanks need to be filled. “This allows the operator to signal someone, so the tank can be topped off at a convenient time to keep the paving train rolling,” Erdmann said.